Did you know that the current housing shortage means that the UK needs to be building 240,000 – 300,000 homes annually until 2025? Despite this, the rising costs of building homes and a declining number of skilled workers has meant that unfortunately, the current industry is only managing to build 190,000 per year. But Insulation Express have uncovered that modular homes could be the answer to the UK’s housing crisis. This form of pre-fabricated building is built in factories away from the site where the property will sit. Sections are transported to the site, and then constructed into a full home. 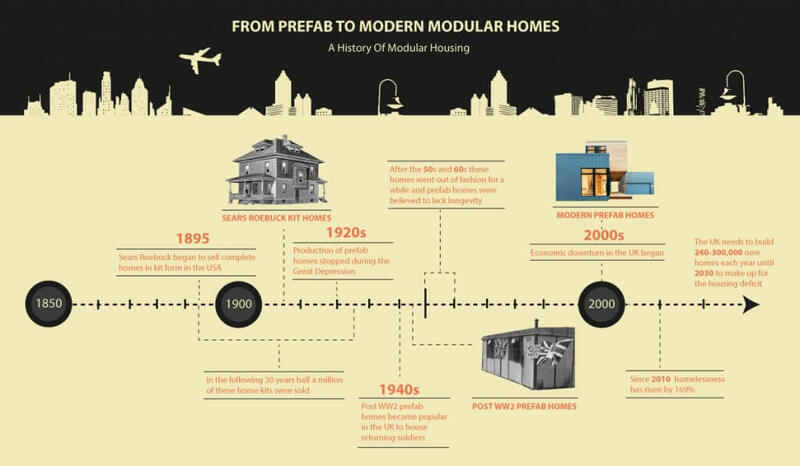 Not only are modular buildings quicker to construct but they are made in such a way that workers do not need to be as skilled – which makes them an ideal solution for the current problems the housing crisis is facing. Since 2010, unfortunately there has been a 169% rise in homelessness across the UK. What’s worse is that this doesn’t count those that are living in temporary accommodation, so the official figure could be much bigger. The National Housing Federation has also found a direct link between the housing shortage and the rising levels of homelessness. Of the houses that are being built, too few are social or affordable. So much so that between 2011 and 2017, private rents increased a whopping 60% faster than wages. Naturally, this has led to more households trying to get off the private ladder and instead, into more affordable social housing. As previously mentioned, the government has plans to build 240,000 – 300,00 houses (both social and private combined) to overcome the housing shortfall. However, the industry is consistently failing to meet this target as in 2018, only 183,570 homes were construction. And only 41,350 of these were classified as affordable. It gets worse though – in 2017, there were 1.2 million households on a waiting list, and this is only set to get worse. If the housing shortage continues as its slow growth, then 100,000 UK households will be in temporary accommodation by 2020. But why is this happening, you ask? Well, it is mostly due to a falling number of skilled workers and a lack of government funding despite their desire to build more. It could be about to get a lot worse too as after Brexit, there could be fewer skilled workers and the usual £10 million of EU finding will not exist. 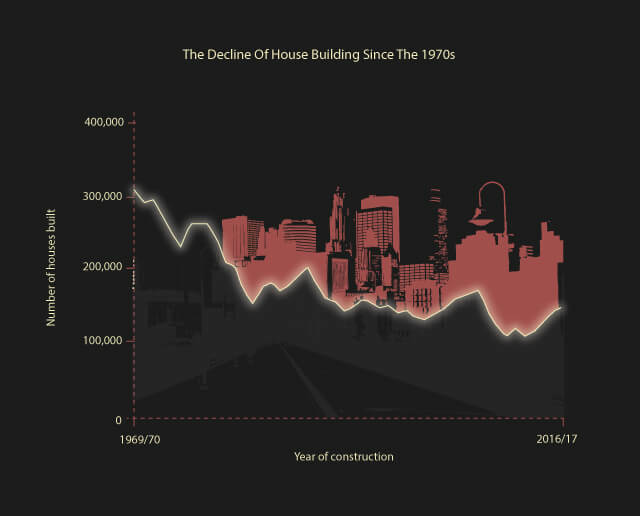 As you can see from the graph above, house building has been in decline since the 1970’s. 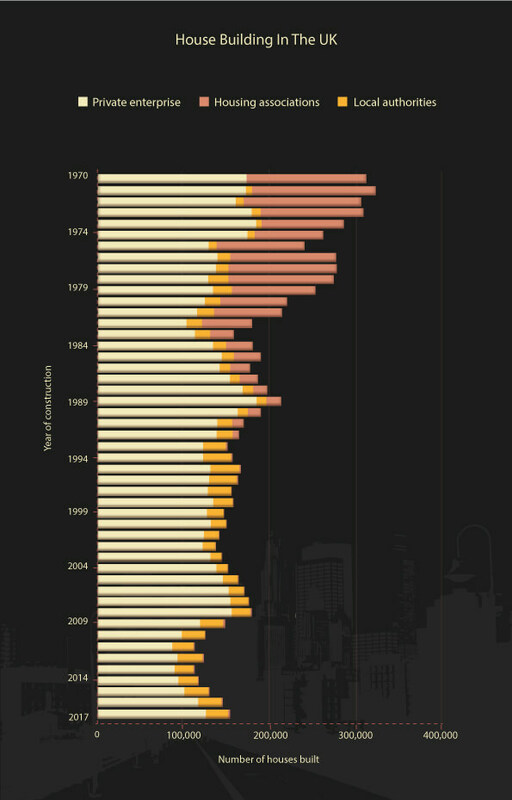 In 1957, 97% of homes in Scotland were constructed by local authorities. But in 2017, this had fallen to just 7%. In England and Wales, this stood at just 1%. 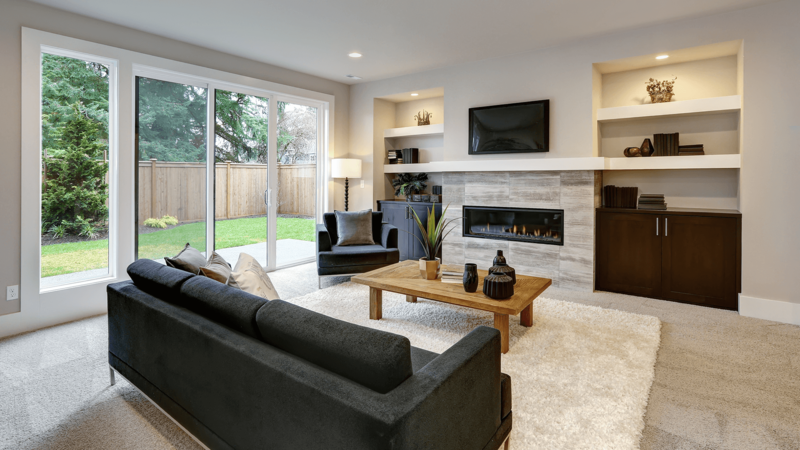 Modular homes are more affordable as they take less time to build, and therefore making it easier to produce more in the same time as a more traditional built. For example, a modular home can be built in 2 days whereas the average traditional build takes 32 weeks. Unskilled workers can also be hired – As modular homes are manufactured on a production line, it’s easier to train staff which will help overcome the current declining workforce in construction. Poor weather can’t hamper construction – Again, because modular homes are manufactured in factories, the number of days that construction can’t take place will be reduced. They’re cheaper than traditional builds – Prices start at £25,000 which is 11% of the cost of the UK’s average house price. Known for innovative regeneration schemes, Urban Splash are now creating modular homes that allow prospective buyers to design their own homes. The buyers have a choice in everything from deciding how many floors to the number of bedrooms, and even where plug sockets will go.